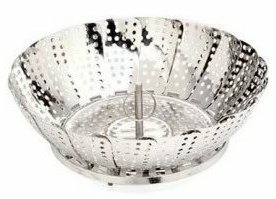 Need Help Choosing A Food Steamer? Our no-holds barred guide shares pros and cons of the most popular types of steamers. Is collapsible okay? Or should you spring for electric? We're here to help clear up the confusion so you can find the steamer that's just right for you and your cooking needs. I'm not exactly sure when we all started moving away from the easy-peasy stainless steel collapsible steamers you can buy for about $10, to the electric steamers that sit on the countertop. As healthy cooking and eating natural whole foods grow in popularity, so does cooking up whole grains such as rice. 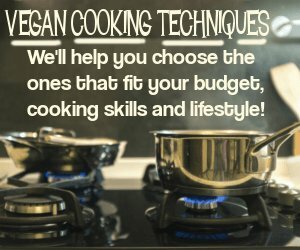 Finding a tool that can help you out by steaming vegetables AND rice or other whole grains makes sense and can save you a lot of time in the kitchen. Really, electric food steamers are meant to make life easier but they DO come with a price tag. So then the question becomes, what's the difference between the various food steamers out there and which should YOU choose? 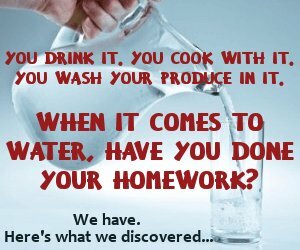 It completely depends on your level of experience in the kitchen and your own particular cooking needs. Okay, it doesn't get much more low-tech than this. There's a reason these are still bought and used so often. 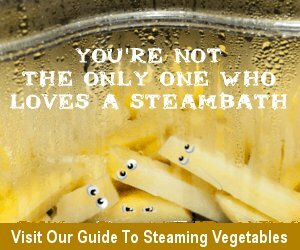 If ALL you want to steam is vegetables, then there is no reason to look any further than a steamer insert. This was what we started with way back when and it's what many new cooks start with too. They're very easy to find, but for your convenience you can click here to order one. There is a drawback to these. First of all, the thingy you latch onto in order to pull it out of the pot (yes, when it's hot and steamy) is smack dab in the middle of the whole thing, so you need to use a hot mitt when you pull it out of the pot. But with a price tag of around $5, you really can't expect perfection. In the end, these are great for steaming vegetables, especially if you're a new cook. It expands to fit large pots. It collapses to fit smaller pots. Alternatively, there is a slick little number by OXO that does the same thing. We own this silicone steamer as well. It has nice big handles on the sides that make it easy to pick the insert up and out of the pot. This won't work in smaller pots, it has to be a medium-size pot or larger. 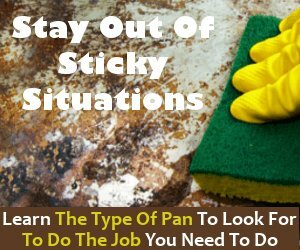 Since it's made of silicone, it won't scratch anything (especially worth noting if your pots are lined with Teflon or some other non-stick coating that you don't want scratched). It costs a little more, but it still won't break the bank. Click here to order. If you're up for spending a little more, then check out this 18/10 stainless insert made by Cooks. You can see it's a little more heavy duty. But then, it also costs more too. It has handles. It has graduated ridges on the bottom so it can fit many different sizes of pots. And it comes with its own lid -- which makes sense since it might end up sticking entirely out of the pot altogether. This steamer is going to last you a good long time, and since it fits in many different pots it really might be worth the extra price tag. If you think you'd like to steam more than veggies (such as grains or small legumes/lentils), then consider the electric steamer. The brilliance of these is you can just set it and walk away until the timer goes off. 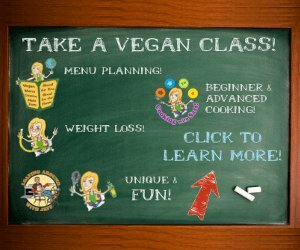 Many have multiple levels that allow you to cook vegetables AND grains at the same time. Now, for years we used electric counter-top steamers made by various brands. Black & Decker was our fave, but we tried others as well. The bummer is that every single one of them have been made of plastic, and we're trying very hard to eliminate plastic from our life. In point of fact, if you go searching for a non-plastic countertop steamer you're going to be astounded. Nearly every steamer that is offered out there is made from plastic. So annoying! 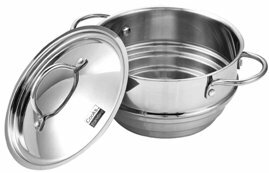 Fortunately, there is a stainless steel steamer you can check out here. I like this steamer because it has multiple levels so you can cook more than one thing at a time. For instance, you can have a batch of grains cooking and then just before they're done, add the next layer to steam some veggies. Or steam grains and lentils at the same time. Or veggies and small legumes. You get the picture. When cooking is your life and your kitchen is basically your office, you end up checking out a lot of different kitchen tools and gadgets. I was a little resistant at first to a 3-in-1 cooker -- that means it's a steamer, a pressure cooker, and a slow cooker all rolled into one. I guess I'm just old school. I already have a stovetop pressure cooker. And my handy dandy countertop steamer AND in-pot steamer. 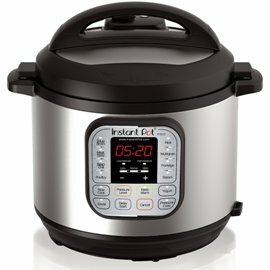 As for a slow cooker -- I had an extremely bad experience with one once where the bottom of the container burned so badly I could literally pick it up and look through to the other side of the room. Jeff is the one who really took a liking to this kitchen tool. And I have to say, I am 100% impressed. If you can afford one, I really recommend you get yourself a 3-in-1-cooker too. It's just SO easy to use it to cook so very many things. Here's the one we recommend. I call it a 3-in-1, but they call it a 7-in-1. The inside is made with beautiful 18/10 stainless. I really like that this company works hard to get stainless steel products out on the market for those of us who don't want to use plastic (or Teflon) as much as we used to. So I like supporting them and giving them a vote with my dollar(s)! Plus as I said, you pay one price for one small appliance and you can do SOOOOO much with it. So much more bang for your buck. 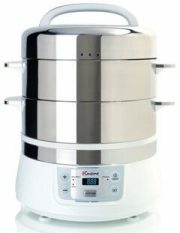 You can use it to steam veggies, steam delicate grains and small legumes, to pressure cook beans and some grains, and slow cook soups and stews. Awesome investment. I think you'll really love it too. 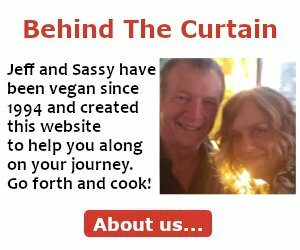 "Thank you for your website!"